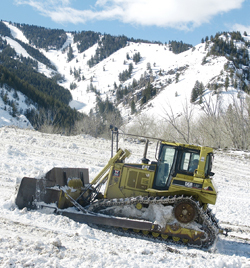 Ketchum Street Department employee Greg Allan drives a CAT D6R dozer to push snow toward the top of a snow mountain created near River Run in south Ketchum. The snow pile, gathered from Ketchum?s streets this winter, is estimated at 150,000 to 200,000 cubic yards in size. The pile?s not as large as the one created two years ago at the same location, which was estimated at nearly 300,000 cubic yards. Moveable Feast heads to the ?Wilder Shores? Should property taxes be raised to fund ambulance service?